Football Mindfulness, Adrenaline and Temporary High or Lasting Bliss? Football Mindfulness, Adrenaline and Temporary High or Lasting Bliss? 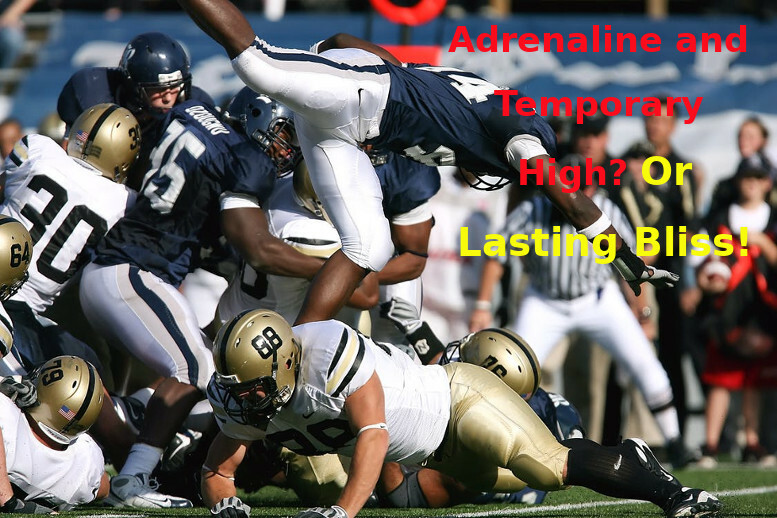 Adrenaline and Temporary High or Lasting Bliss? Is it Football Season at your home? Does it get all rowdy? Football Mindfulness Adrenaline. Watching Mindfully can reduce the sense of failure or false ego dependence. I got a text message this morning about this Sunday’s football games. “A real big thing!! !” The caller said. Unfortunately, he won’t make it to the retreat. I asked my son about it, who informed me that there will be the AFC and the NFC Championships and that the winners of each will match on Feb 3rd. The most watched event anywhere! “Good thing the retreat is not on that day,” I said. I remembered those days, when my two sons and their father plus many others would gather in the living room and the kitchen with food, alcohol during football season and did the whole dance. I tried to like the games, went with the flow, screaming and even helped choose and bet on a winner. Somehow, 11 out of 15 guesses, I was right. It was loud, by my standards today, it would be as if louder and bigger storms kept hitting. Adrenaline rush every time there was any movement in the games. I remember, how much our minds clung to the winning moment, even to the smallest little yards of wins. Reminiscing now, this question pops into my head, Adrenaline and Temporary High or Lasting Bliss? A very tough choice, so it seems. However, if you have experienced the peace and calm, the joy and bliss that arises as a result of a day of practicing Mindfulness and meditation away from the routine of the day, the same old environment and shared a beautiful experience with others, then you’d know that there is no comparison. In fact, you would clearly see the stress, tension and aggravation, the worry and anxiety that accompanies such rush of adrenaline. The attachment that is formed by taking sides and rooting for one side or the other for Football Adrenaline. Forming such fickle identities can be devastating or temporarily ego boasting, resulting in a flat, unhappy, dependent ego. How to do Football Mindfulness Adrenaline? I left such a life, but if you do stay home to watch the games, bring awareness to your mood, your mind attaching, believing, hoping, and leading to unhappiness. Catch yourself, thinking, “My team should win,” and not ever considering that the fans of the loosing team would be as devastated and crushed as you would be. Knowing first-hand the high and the low of the winning and loosing can help you feel compassion. Try not to wish loss on the other side. “What’s the fun, then?” you ask. Well, at least you walk away peaceful after the game and remain a human-being as opposed to a human-failing. And if you’d rather let go of come to the retreat to calm your mind, cleanse your body, re-set your goals and intentions for 2019, we still have a couple of spaces available. The choice is yours. It is with our choices and actions that we strengthen the causes to our happiness or unhappiness. It’s just a simple math. A matter of cause of effect.